Josie Eugenie got just what she wanted for her birthday, and we couldn’t be happier for her. Dozens of people came together to help her celebrate her 24th birthday; thoughtful, kind individuals and families accepting of a world where not everyone is the same. Before Josie’s crowdFunnit birthday party she had expressed, “Being Autistic I’ve always had difficulty making and keeping friends. I can’t help but feel disappointed when everybody my age goes out with friends or has a big party. It makes me feel like I’m not really worth getting to know” So much has changed since then. All the folks who donated to Josie’s GoFundMe page which helped purchase gifts. Also special thanks to ABC News WKATU for covering Josie’s party invitation and then covering Josie’s birthday party. Josie grew up on the autism spectrum in addition to having a rare progressive connective tissues disorder called Ehlers Danlos syndrome. Despite her family’s efforts, she never had a traditional birthday party many of us take for granted. But on October 1, 2016 Josie enjoyed the presence (and presents!) of many people of all ages, many dressed in Lord of the Rings costumes, a personal favorite of Josie’s. “My mom and my grandparents… strived really hard over the years to make my birthday special, but the friend aspect was not so much. So it was mostly just my family,” she said. 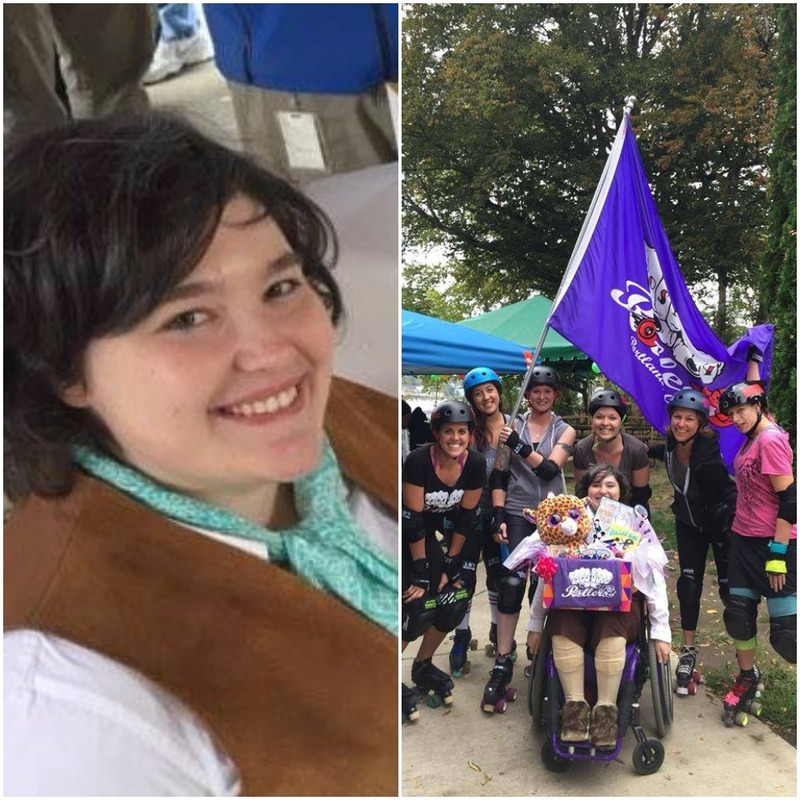 Also a very special thank you to the The Rose City Rollers Roller Derby Team (the Wreckers) at Josie’s crowdFunnit Party who gifted Josie with roller skates and a basket full of other goodies! Josie has learned that roller skating in addition to being fun, is an easier and less painful way for her to get around than walking. In addition she’s been embraced by the Rose City Rollers Derby Team. cheers them on when she’s not skating, and she’s super happy with all her new friends! ” I made a lot of new friends, mostly from the roller derby girls, I’m actually going to take their derby 101 class. They donated a pair of skates and some super protective knee pads/shin guards to keep me safe. Josie was nominated to crowdFunnit by Laura Wolfenson, a RISE Family Services Coordinator. crowdFunnit, a project of the 501(c)3 nonprofit Cherab Foundation helps to bring awareness about differences to those that are bullied or alienated, while fostering acceptance, compassion, and friendship through open-invite birthday parties. As word got out about her party, friends and strangers arrived to celebrate, making up for the parties Josie never had.